A gently sloping driveway leads to this historic West Seattle property, hidden away among tall trees on a little knob of hilltop overlooking Puget Sound. Patti’s goal in 2000 was to restore a sense of verdancy and connection in the landscape – reclaiming it from blackberry and patchy grass to, creating a garden for all seasons. At the top of the driveway the original log-built home (rumored to have once been a hunting lodge) comes into view. Begin the tour to the left up a short set of steps to a three-family vegetable garden (2017) or walk ahead to a basalt column nestled in a cloud of fennel into the cutting garden. Witch hazel (Hamamelis) adds height and structure above a vibrant tapestry of iris, delphinium, alliums, roses, campanula, and lilies. Airy stems of scarlet and orange geum mingle with deep blue tradescantia and nodding columbine. Basalt basins catch gently running water. A cedar fence marks the transition from cutting to patio garden. Look left for Harry Lauder’s walking stick (Corylus avellana ‘contorta’), an eight-foot tree peony and Edgeworthia ‘Nanking.’. Conifers at the southern patio edge provide afternoon shade for summer sitting. Pale blue ceanothus and wisteria soften stone walls. Mugo pine, pots of summer annuals and roses surround the flagstone patio. 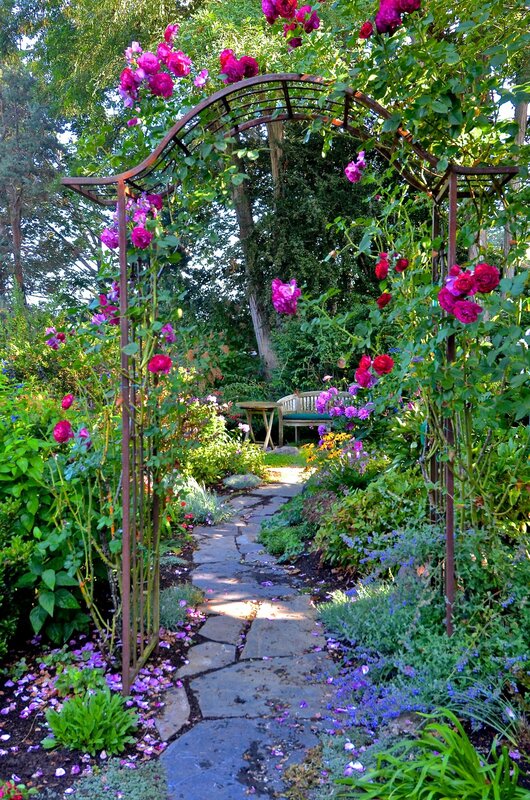 Continue north from the patio under the rose arbor into a shade garden, where Rosa glauca, rhododendron, and eastern white pine are prominent players. Salvia guaranitica and fuchsias fill in the edges. A second patio surrounded by ferns, hostas, fuchsias, and seasonal pops of color is ahead. Exit passing under a chocolate vine (Akebia quinate) into another shade garden. Three beautiful Japanese Snowbell (Styrax japonica) underplanted with astilbe, ferns, dwarf evergreens, and hostas come into view. A few steps ahead is Patti’s favorite spot – where you will want to stop, look and listen.